Lindsay Peck cuts a slice of bread at Great Harvest Bread Company recently. 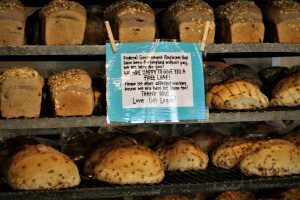 Great Harvest in Logan offers a loaf of bread to furloughed federal workers. Its day 28 of the government shutdown and some businesses in Cache Valley are offering to help those affected by the political tug of war. Great Harvest Bread Company located at 37 W. Center has set up a “Shutdown Shelf to help government workers furloughed or made to work without pay. James Clawson of Great Harvest Bread Company, located at 37 W. Center in Logan, has set up a “Shutdown Shelf.” He is doing his part to help those made to work without pay. The shelf is stocked with fresh baked bread for families affected by the partial government shutdown. He said they are helping furloughed federal workers by offering them a loaf of bread. They haven’t had a big rush but there have been some who have come in. “If someone comes in and needs a loaf of bread we will give it to them, those affected by the shutdown,” Clawson said. “We’ve had a couple come in and one of them said her whole department had been furloughed. So we are expecting them to come in,” he said.